It’s almost Easter, time to roll eggs, bake hot cross buns and eat chocolate till your heart’s content. 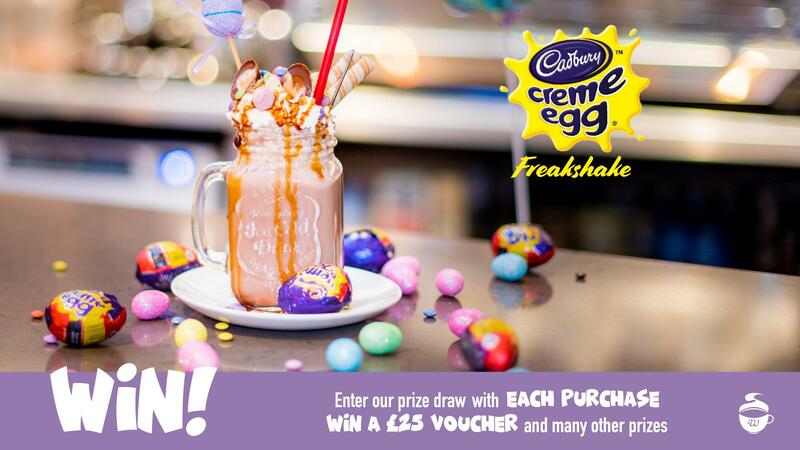 Everyone knows that chocolate at this time of year doesn’t count.
. . . our very own Creme Egg Freak-shake! It’s available from 28th March and throughout the Easter holidays. To top it off, with every milkshake you purchased you’ll be entered into our fantastic Easter Raffle. With 10 amazing prizes up for grabs, including our top prize package of a £30 gift card, a cuddle bunny and a giant Easter egg plus many other prizes. Full terms and conditions below. So, come on down to Willows and make the most of this guilt free time of year!